Soak the raisins with the rum for at least 2 hours. Heat the oven to 400° F. Line 18 muffin tins with paper cases or brush oil on the bottoms. Sift the flour, cocoa, salt and baking powder into a bowl. Mix in the coconut and sugar. In another bowl mix the milk, eggs and melted butter. Stir in the rum and raisins. 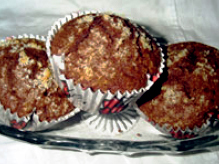 Spoon the mixture into muffin tins and sprinkle the tops with coconut. Bake for approximately 15 to 20 minutes. They are ready when a skewer or toothpick comes out clean.